Every so often a WyGo supporter or someone on our Facebook page will ask why we need to fight so hard to pass gun bills, after all, isn’t this Wyoming? When I explain to them that we have too many moderates in the legislature and that national gun control groups, like the one funded by NYC billionaire Michael Bloomberg are active in Cheyenne, many don’t believe me. Well, you don’t have to take my word for it. Bloomberg’s organization is working state wide to shut Stand-Your-Ground law down, as you can see from this screenshot below. And nor is Bloomberg simply lobbing emails into Wyoming. He is working, on the ground in Cheyenne, by hiring a contract lobbyist to work the legislature to try to stop Stand-Your-Ground law. Look at the screengrab we took from the Secretary of State’s website, under the lobbyist listings! And, as you can see, Ms. Hallgren’s lobbyist documents were updated LAST TUESDAY! I don’t know about you, but when I think about an elitist billionaire from New York City sending his hired guns into Cheyenne to tell us how much freedom we can enjoy — it makes my blood almost boil! Folks, we need your financial help to battle back against Bloomberg’s machine in Cheyenne, right away! Insiders report to me that Bloomberg is going to be mounting a radio and TV campaign to stall the bill. Bloomberg did the same thing in Idaho, in 2015, when they passed Constitutional Carry there. When Missouri enacted Stand-Your-Ground law in 2016, Bloomberg waged a media assault to try to stop it. In both cases, he was defeated by gun rights groups on the ground who mounted a counter offensive –- groups who had the resources they needed to fight back! 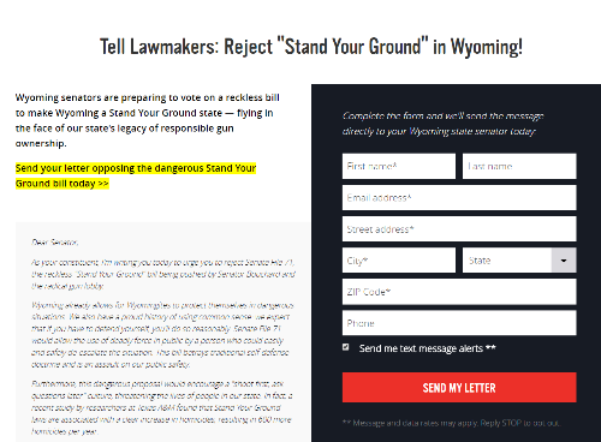 As I type this, Wyoming Gun Owners is developing a powerful radio and TV ad that we hope to air, to maintain the heat for Stand-Your-Ground law. But we are going to need your help to get this on the air! Please contribute what you can, immediately! Are we going to let our Second Amendment rights be dictated to us by a gun-grabber who lives 1,735 miles away, surrounded by 24/7 armed security? Or are we going to fight back, and make sure that you and I don’t have to retreat any longer when being attacked by a violent criminal? Please help us show Bloomberg that he’s not welcome in Wyoming, by making a donation to WyGo’s program TODAY! And don’t forget, the House Judiciary Committee will be voting on Stand-Your-Ground law (HB 168) tomorrow (Feb. 20) at 12:00pm! Make sure you’ve email the committee members, all of the information is in our previous email. P.S. NYC billionaire Michael Bloomberg is working overtime to try to stop Stand-Your-Ground law here in Wyoming — including hiring on contract lobbyists who live over 1,700 miles away from Cheyenne! It’s imperative that we fight back. WyGo is already preparing a radio and TV ad campaign to keep the heat on in Cheyenne — but we need your help to fund it! And don’t forget, the House Judiciary Committee will be voting on Stand-Your-Ground law TOMORROW AT NOON! Make sure you contact the members of the committee between now and then, using the information we provide in our two previous emails!